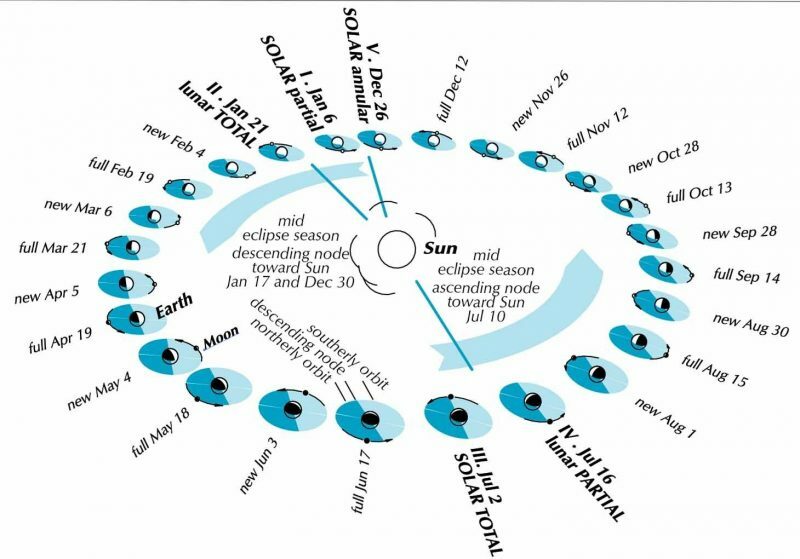 A heliocentric – or sun-centered – view of eclipses in 2019 from astronomer Guy Ottewell. A heliocentric or sun-centered view of eclipses in 2019. Earth-moon orbit shown at new and full moon dates. Sizes of Earth, moon, sun very exaggerated. The plane of the moon’s orbit is blue. There’s an eclipse if the moon is full or new when it is in or near the ecliptic or sun-Earth plane. This year there are 5 eclipses, instead of the usual 4, because a 3rd eclipse season begins before the end of the year. Illustration via Guy Ottewell.